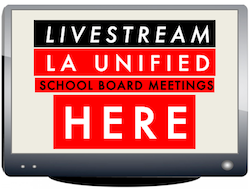 The LA Unified School Board will conduct a special meeting today starting at 2 p.m. That agenda is here, with the supporting materials available here. Then, starting at 3 p.m., the board will hear 30 public comment speakers on the topic of the District’s Final Budget and the Local Control Accountability Plan (LCAP). That agenda is here, with the supporting materials available, here.